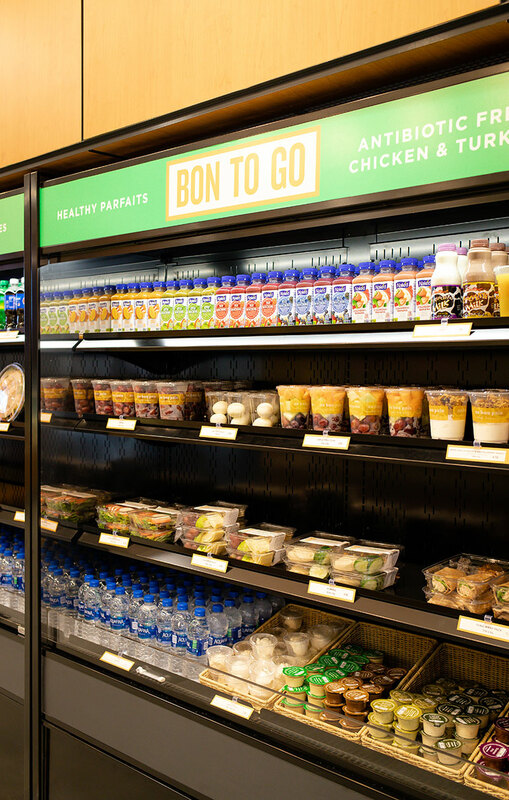 The Grace Street Au Bon Pain unit is busiest in the mid-morning, when students come in to grab something to take on their way to class. When a new Au Bon Pain restaurant debuted on the campus of Virginia Commonwealth University (VCU) in Richmond, Va., last December, it wasn’t just another national chain expanding its presence in the college market. Rather, the eatery symbolized an ongoing commitment on the part of VCU to revitalize a historic part of its host city. The Au Bon Pain sits in a 70-year-old building at 944 West Grace St. that was originally built in the late 1940s as part of an initiative to expand retail in an area that had previously been largely residential with stately brick homes (some of which still remain) since the 1880s. 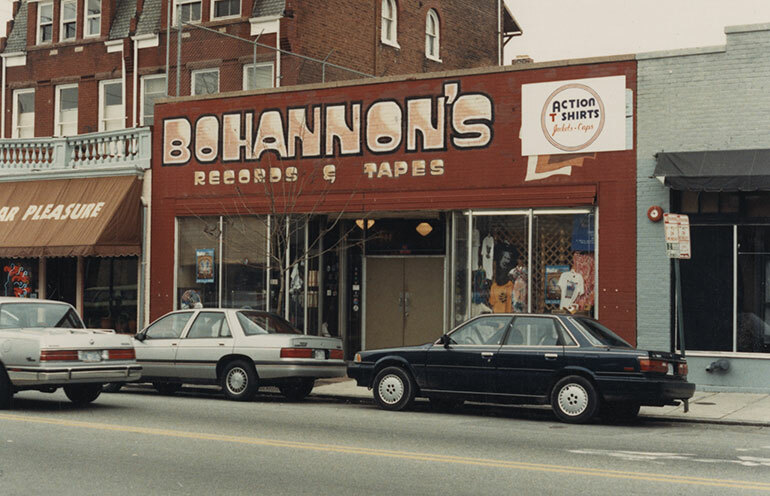 Originally, the building housed a drugstore, then became a record store in 1977 before being purchased by VCU in the early 1990s as part of the university’s expansion in that part of Richmond. Subsequently, it served for a couple of decades as an administrative facility that housed first VCU’s Audit & Compliance Services and then its campus police. When the cops moved out a little over a year ago, the building became a perfect place to situate a dining facility to help serve the growing number of university residences being opened nearby, explains Diane Reynolds, assistant vice president for business services. Grab-and-go choices are plentiful but the restaurant also tries to encourage hand-around business. Those offerings include a university-operated Panda Express unit, plus VCU’s Laurel & Grace Place food court, located about a block away, that has IHOP Express and Raising Cane’s units as well as a self-branded concept called Croutons, Salads & Wraps that specializes in plant-forward dining. In addition, the Grace Street corridor boasts several independent and chain restaurants and shops. The location sits at a high-traffic intercept point. Bakery cases visible from the street help merchandise the restaurant. “It is kind of a thoroughfare for students to and from their classes,” Reynolds notes, “and about a block away from our convocation and athletic arena and close to parking decks.” In addition, she notes that a recently adopted campus master plan calls for even more student housing to go up in the immediate area. 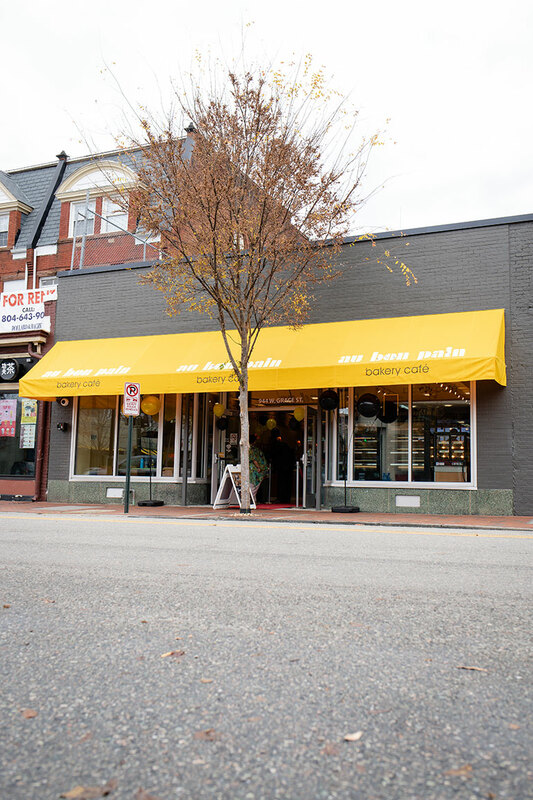 Besides serving VCU students, the Au Bon Pain is also open to the public, with a street-facing storefront attracting members of the Richmond community who live nearby, as well as employees and patrons of nearby businesses. These include the staff and residents of an assisted living facility located about a block away who often pass by the restaurant to go to the nearby Walmart on Campus store to shop and get prescriptions. Walmart on Campus is a downsized version of the giant retailer’s traditional stores that is designed to fit the restricted footprints available on college campuses. 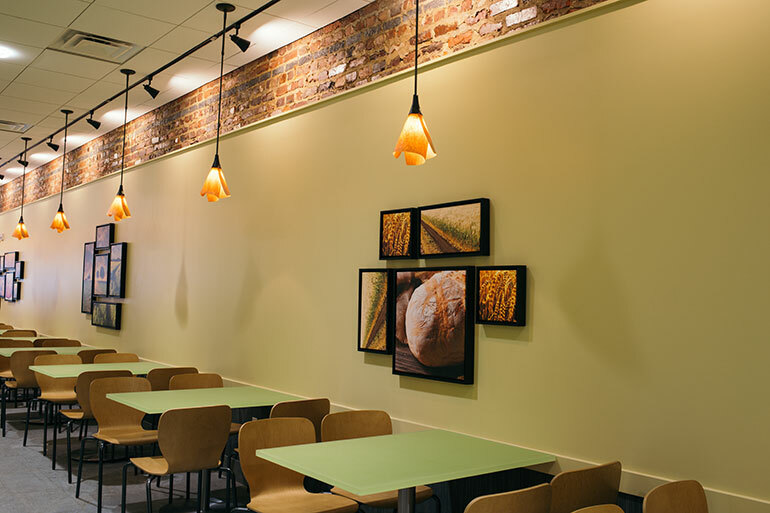 Preparing the space to hold an Au Bon Pain unit posed some challenges as the university wanted to retain as much of its historical flavor as possible. The façade of the historic building was redone with a new awning that maintained the original frame, plus refurbished windows that maintain the look of the original storefront. As the brick looked better nearer the ceiling, the solution was to put sheet rock up to cover the lower portion of wall while leaving the part near the top uncovered. “That adds to the character and gives a nod to the original [look] so you know you’re not entering new construction when you walk in,” Reynolds says. She also wanted to preserve the storefront, but the glass was in bad shape and had to be redone. “But in terms of the actual frame and design as a wonderful storefront, we wanted to maintain that integrity,” Reynolds says. 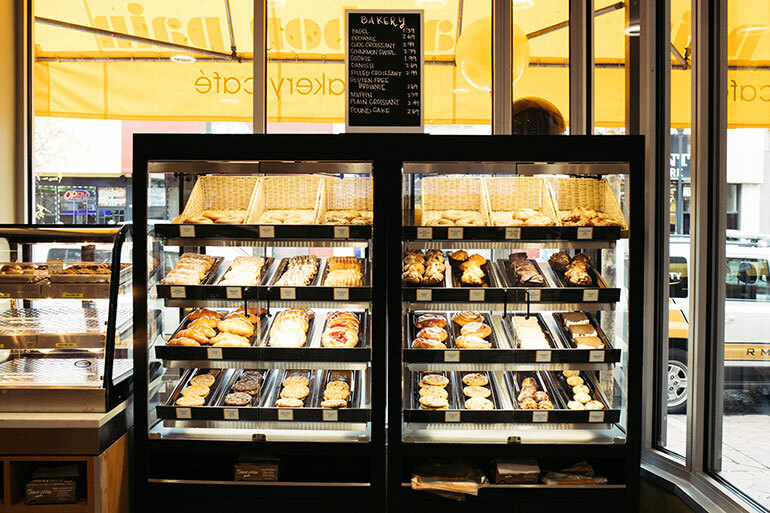 The windows face the bakery counter in an astute piece of visual merchandising on one side of the front entrance, and the seating area on the other side, so that patrons can look out while passersby can look in. The Au Bon Pain location was originally a drugstore and then this record shop from 1977 when VCU purchased the property in the early 1990s. The Au Bon Pain brand was chosen by VCU students to occupy the Grace Street space in a survey that offered them options from across the brand portfolio available to Aramark, which operates dining services at the university. The restaurant’s menu is the typical Au Bon Pain range of offerings, from pastries, sandwiches and coffee to soups and salads. The Au Bon Pain unit’s hours currently are 7 a.m. to 9 p.m. during the week and 8 a.m. to 8 p.m. weekends, but it has been busiest in the morning so far, Barr notes. Renovation of the 70-year-old building left touches like the brick façade that remains visible near the ceiling. That’s to-go business, but the restaurant was also designed to accommodate those who wish to hang around, with electrical outlets at almost every table. “We anticipate that now that spring semester has begun and students are developing their routines, that a growing number will begin to visit the location in the afternoons and evenings for dinner,” Barr observes. Current daily customer counts run at around 500.